I once read somewhere or other that we are more inclined to purchase something from someone who is within seven years either side of our own age. So why don’t Advertisers take this on board when trying to market products to us? Especially those in the beauty industry. I’ve always loved make up and beauty products and always will no matter how old I get. As a former makeup artist it’s just part of me and I will continue to try new products. Even when I intellectually know that there will be days when my wrinkles would be better assisted by spac filla from the hardware store than expensive moisturiser from the department store. However, why is it I get the feeling that Brands regard everyone from their 40s up as comedic fodder. Why don’t we get to see believable, yet inspirational imagery that we can relate to? Not wrinkle free, photoshopped 20 and 30 somethings, no matter how gorgeous they are, advertising products designed for mature women. It seems the huge focus on youth has diverted attention away from where society is heading. The population is aging dramatically. In the next 20 years the number of over 60s will double and they are rewriting the rule book of advancing years. That means, billions of potential purchasers who are surprisingly interested in way more than just the stereotypical products such as bifocals, funeral insurance, zimmer frames, wheelchairs, retirement homes and incontinence products. So wake up advertisers. You need to better engage with the middle-aged and the elderly because ultimately the prize for you is going to be huge. You see, we cannot look or act like 20 or 30 somethings no matter how much of your products we use or how much surgery we have. And we are not doddery old folk who have given up on life. Most of us just want to be the best 40, 50, 60, 70, 80, 90, 100 somethings we can. Besides, the most valuable consumers for a brand are those who are prepared – and have the financial means – to purchase? In these times of economic slowdown, it’s older people, in general, who are better placed to retain their spending levels. In fact those aged 45-64 have the highest discretionary spending power. And according to Ad Research the greatest growth in the number of online shoppers is among the over 75s, closely followed by 55 to 64 year olds. Who would have thought it? So let's get the marketing images a bit more realistic. 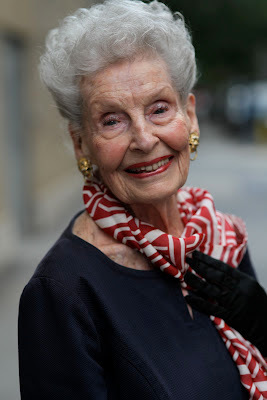 Here, for example, is a picture of 101 year old Ruth who appeared on one of my favourite blogs, Advanced Style. 101 years old. No use of photoshop or cosmetic enhancements. I would most definitely be more inclined to buy a beauty product from someone who looks 40 years younger than she is than someone who is in their 20s and 30s and looks it, wouldn't you? Go on Brands, reinvigorate yourselves and be a little game to try something different. We are ready and waiting. The benefits may just surprise you. the greatest growth in online shopping - really? Is that a tricky twist to some statistic? Ok that detail doesn't really matter to me. I get your point and agree. People are most comfortable with people like themselves. I have a problem with what I believe marketing spends too much time try to do - sell fantasies. BTW - a post or two ago you mentioned this rich Aussie (she still won't return my calls) lady in the mining (coal?) industry. Have you heard of Sara Blakely a self made billionaire? No but I will google her. American is she? The Australian is Gina Reinhart - she inherited millions form her father (mining) and turned them into billions. she is horrible inside and out and very litigious so I better be careful what I say. As for the stats - apparently - maybe everyone else is already using online shopping lol. Ruth looks fantastic! And you have a good point about target marketing to mature people! Yes we exist hey Christine. Advertisers could also use blogs of people in our age group to see more too. I LOVE that you follow Ari's blog ... so do I and I am constantly amazed at his photos of these women who are my role models!!!!!!!! I know Helen, they are amazing. These are the women we all need to be admiring. I truly want to know what their tips and tricks are. And I would buy what they use. hands down. Bloody hell yes. It is about time that Brands focused on the middleaged and retired. And as far as advertisers go they just need to admit that we all exist. Their loss I guess. Ruth is just gorgeous, it is hard to believe she is 101. I know, there are far more gorgeous older women on Ari's blog too. It is really exciting to see elderly women who are so creative and stylish and whose appaearance matters to them greatly. Great role models for the rest of us. So true, my dear....It is kind of amazing how ALL walks of the Advertising World pretty much ignore us older folks....And it is so true in the Film and TV Business, too....I don't think they realize that this is such a HUGE Market!! And it makes great sense that On-Line Shopping will be BIG for the older folks like myself---It is so much easier---And everyone wants easier if they can get it! Well I think Naomi that if they are not smarter things will come unstuck in a few years from now. They dont know what they are missing perhaps. although a few clothes designers have started to use older models to sell their clothes - sensible. The realistic frame of reference is REALLY important - good point. I think our self esteem would be far heathier if the whole image thing was far more authentic - and that is true for women of all ages. Great post Lilly! You tell 'em!! :) Completely agree. If only they read my blog, he he. Yes it is true, it's like we disappear after our mid 40s from the advertising landscape unless of course as you say it is some dithery old person trying to see funeral plans or some such thing. They will be sorry when the time comes when their biggest market is older people. Ruth looks amazing. And you are so right that ads should be targeted to us mature folks. Thanks Beth, one day they will get the idea. I'm just not all that interesting in beauty and fashion ads because none of the women seem all that real. Seems like a waste of money to spend. Of course that might change is I saw a "real" person modeling the clothing or using some beauty product or another...but in the meantime I'll spend the tiny disposible income I have on books, and music and the type of stuff that stimulates my brain. True, they may be real but they are no-one we can identify with. Love the picture of Ruth. I think she's beautiful! She is, those cheekbones are incredible. She's 101? That is just so amazing! I'd like to know how she does it. Wow! I've seen a number of make-up ads with somewhat more mature women. Ellen DeGeneres, right? They do look rather doctored though. In fact, most of the ads look like they've been air brushed or whatever. That is true Kay Ellen DeGeneres is one but she is so airbrushed she looks like 20, lol. At 101 years old, Ruth looks fabulous. I agree with you about having models in the same age category as those whom the company is trying to market their products to. Now that I'm older, I need more of that beauty stuff than when I was younger. Hehe. Tasha you hit the nail on the head. The old we get the more help from products we need, lol. Have a question to test the makeup expert ... keep telling the daughter, if you're going to slap something onto your face buy it from Myer or David Jones. But youth never listen, she gets her yellow Clinique goop for half the price at Strawberrynet and Mizspa. Am I right or it's ok to save $40 a bottle? So if she wants to buy some new makeup say, she sould go to the makeup counter in Myer or DJs and get their advice about a product and then buy it online. I think Strawberry is still cheaper than buying it online from Macys etc. I have been buying from them for about 10 years. They are perfect for finding things you cannot buy in Australia and for perfume (in case you want to buy your wife a great gift!). They do not stock everything though and sometimes colours are limited etc. They are based in Hong Kong. We dont pay tax on them coming in which you have to do in the UK and the US. They also deliver in a few days and it is always beautifully gift wrapped. You may need to apologise to your daughter and congratulate her for her smart and savvy buying ha ha. thanks for thinking of me, I do love makeup!